This New Year, people are more concerned upon having a well conditioned body with zero fat concentration. 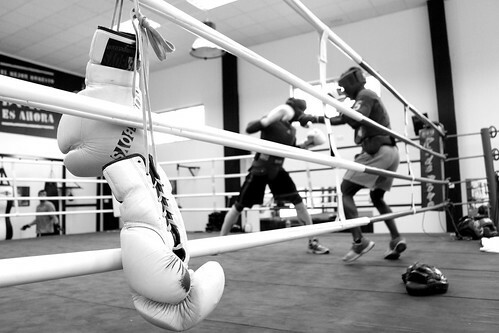 There are various fitness clubs that provide excellent training upon boxing. There are some facts that can always help a person to gain the right kind of body to begin with. There are many advantages of boxing. It is an excellent kind of cardio workout. The entire body can be conditioned through a single boxing workout. It is a high calorie burning routine that enables the body to lose fat in large quantities. Beginners need to maintain certain rules and regulations for achieving proper training in boxing starting from equipments to workouts. The Basic Equipments that every budding boxer needs are wrist wraps, boxing gloves, punching bag and jumping ropes. The basic training program involves the establishments of a boxing stance. Body positioning is very essential to start with as correct standing will help in achieving better results from the workout sessions. It also reduces the risks of developing joint strains. Beginners can stand in sideways posture and consider the punching bag as their opponent. It is essential to place the feet a little further than the shoulders in width distance. It is important to place the subordinate side your body facing the target. Experts always consider keeping the dominant hand at back, and it is necessary to bend the knees and to distribute the weight of the body. It is important to place the hands at the chin level as this enables to make gentle fist movements. There need to be at least 6 or 8 inches of distance between the dominant rear hands, the one, which will help in punching the opponent. It is best to keep the arms placed around the torso area. There are many institutes on personal training in Phuket that assure to provide their candidates with the best possible education on punching techniques. A boxer is only said to be good, when he or she throws proper punches against his or her opponent. A good punch is signified with proper rapid extensions of the upper limb. This movement is followed by fast retractions. A person will need to extend the rear arm outside towards the opponent while rotating the hips to face the front for a fast and powerful cross punch. It is essential to pivot over the rear football while strengthening the legs for a speedy, lengthy and power pack punch. It is essential to keep the front arm extended to jab. This sort of punch does not necessarily require any hip rotation. A number of factors are very important for proper boxing training. An immature boxer always requires proper amount of sleep and adequate nutrition for muscle building. It is essential to increase the quantity of protein in the diet as it helps for enhanced muscle building. It is necessary to warm up the body before punching the bags. A simple warm up workout involves jumping of ropes. Rope jumping process can continue for a time period of 3 minutes. It is enough to prepare the muscles to get ready for the bigger workout part. Boxing is considered to be the best way of losing weight. It enables the body to lose weight in large amounts and also to tone down the muscles in an effective manner. Author’s Bio: Alisa Martin is a proficient writer. She writes about fitness, boxing training and other several topics. Her writings always contain authentic information.